Bedbugs (Cimicidae) originated as parasites which infested the nests of birds. These nasty little creatures feed on blood to survive and have since adapted to feed on any warm-blooded animal (including humans). If you want to avoid a bedbug outbreak, simply follow these easy steps to check for bedbugs in your environment. Check for bloodstains and excrement on bedding. Check mattresses for eggs, nymphs (adolescent bedbugs), and mature bedbugs. Check carpets, clothing, curtains, and upholstered furniture for signs of life. Check nightstand drawers and other dark hiding places. Bedbugs don’t just live in dingy bedrooms and questionable hotel rooms. You can come into contact with bedbugs pretty much anywhere. Cruise ships, offices, even schools, can fall victim to a bedbug outbreak. The mature female bedbug can lay up to five eggs a day. An outbreak can spread swiftly if you do not catch the problem and get rid of bedbug infestations as soon as possible. When a bedbug bites, it inserts two tubes into its victim’s skin. One tube injects saliva that numbs the bite area. This fluid thins the blood for easier feeding. The other tube is the feeding tube and is used only for pulling blood from the host. Bedbug bites are not easy to spot. Typically, the victim will complain about being bitten at night while they sleep. Because a bedbug bite does not usually cause inflammation or redness on the skin, you often won’t even know you’ve been bitten. Redness and itchiness only occurs after the host becomes sensitive to the bedbug’s saliva. If you experience sensitivity due to bedbug saliva, you have been bitten numerous times and your environment is already compromised with an outbreak. Bedbugs like to bite in rows. They will often feed three to four times along the path they make while traveling. The bite pattern resembles that of flea bites and sometimes a misdiagnosis can occur. Asthma attacks have been reported in rare cases, but most cases of bedbug bites simply leave you feeling itchy. Hepatitis B, Zika Virus, and Chagas Disease could technically be transmitted by a bedbug bite. However, no cases of transmission have ever been recorded. Feces: Feces appear as tiny black stains often found in large clusters and comprised of digested blood excretions. Bloodstains: Bedbugs are efficient eaters. Bloodstains might appear on your sheets if you smash the parasite in your sleep while it is feeding or full from a recent meal. Husks: When bedbugs feed, they increase in size and will sometimes shed an old exoskeleton to make room for a large meal. Husks are dry, hollow, and white in appearance. The presence of husks on bedding indicate an infestation. If any of these signs are present, then you clearly have bedbugs and need to check the rest of your house for living parasites and eggs. When bedbugs finish feeding on their host, they retreat back to their hiding spot until they are ready to eat again. Mattress buttons, creases, straps, and tags are prime real estate for bedbugs. These areas offer shelter and are conveniently located near a food source. As discussed above, look for excrement, bloodstains, and husks. In addition, you will also search for eggs, nymphs, and mature bedbugs. The easiest way to check your mattress is with an old credit card and strong flashlight. Remove all bedding from the mattress. Immediately shine the light directly onto the mattress and watch for live bedbugs. Run the credit card along the seams checking for eggs, feces, and husks. Flip the mattress and repeat steps two and three. Bedbug eggs are small, round, and resemble a light-colored poppy seed. The eggs are loosely attached to the fabrics on which they are laid and can easily be scraped or shaken loose. 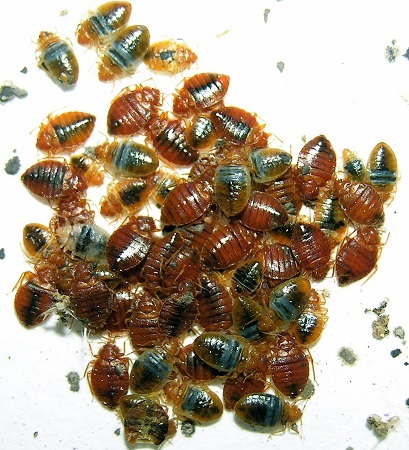 Nymphs and mature bedbugs are translucent in color. As a result, you can see a black or red dot (the blood in its stomach) within the parasite. The mature parasite is about the size of a grain of rice. Keep in mind, all stages of a bedbug’s life can be seen with the naked eye. Even though the Cimicidae parasite is large enough to see, removing all bedbugs can be difficult due to their fondness for dark places and their ability to nest in spaces that are difficult to see. Shake loose fabrics like clothing, curtains, and linens over a tarp or garbage bag to see if any bedbugs or husks fall out. When dumping the vacuum canister/bag, check for signs of bedbugs, eggs, husks, and nymphs. Investigate seams and creases of furniture with a credit card in the same manner as your mattress, described above. Focus on areas where people or pets sleep regularly. Large populations of bedbugs will emit an odor similar to coriander or cilantro. If you notice this smell, consider contacting a pest exterminator that specializes in bedbug removal, as it is evidence of a bad outbreak.